When we visited Fort Lauderdale earlier this month, we couldn't wait to head to the beaches. The challenge was to find a dog friendly beach. Rocco loves to run in the sand and chase the waves. The dog beach pickings were a little slim in the area, so we headed down to the Canine Beach in Fort Lauderdale, even though the website said it was closed due to reconstruction project. We figured if we headed down there super early, it might not matter if the beach was officially open. There were just a few other folks walking on the beach and no one questioned us, so we kept on going! And, as a bonus there were plenty of birds for Rocco to chase! It was beautiful in the early morning. And a nice change from the cold that was sweeping through Atlanta and much of the rest of the country. Don't forget to bring your own water. The ocean may look like a giant water bowl to your dog, but drinking salt water can be harmful to you pup, causing diarrhea and dehydration. Bring a collapsible water bowl. I packed one of these Popware Travel Bowls for our trip and it worked perfectly for a trip to the beach or a walk around town. Stay safe in the sun. If you'll be at the beach for an extended period of time, make sure your pup has shady place to cool off. Dogs can get sunburned too, so look for a pet approved sunscreen to protect pups with light colored noses or thin or short hair. Rinse and repeat. It's a good idea to rinse your dog with clear, fresh water after a romp on the beach to remove sand, salt and any other little critter that may be hitching a ride on their fur. Supervision is a must. If leash laws apply, keep your dog on a leash, but if it's an off-leash area, you'll want to keep an eagle eye on your pup. Not all dogs can swim and currents can carry them out too far for comfort. 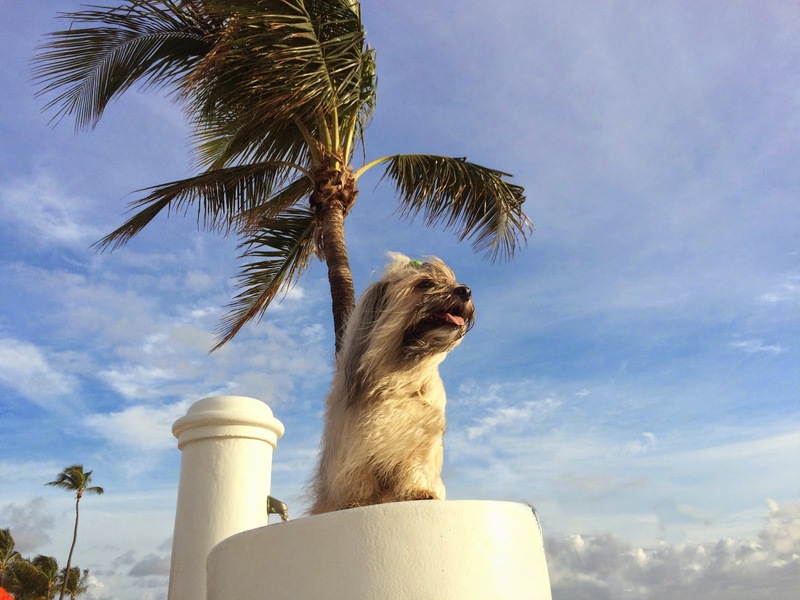 Rocco looks right at home in Fort Lauderdale, doesn't he? Do you have any more beach safety tips? Let us know in the comments below! Oh, we would so love to visit you in California! It looks like you're having so much fun! We BOTH had a blast! I miss the warm! What a great place for a run and you get to chase birds which has to be an added bonus. Have a fabulous Friday. The birds were definitely a bonus! Happy Friday to you! My Human makes sure I have a life jacket on if I'm on the boat or going to swim off of a strange beach. Good one! Life jackets are a great idea. Glad you followed my Mom's advice, rules are made to be broken...closed sign? I'm sure you never saw it! We learned about salt water living in Germany on the North Sea, but all the dogs on vacation had to give it a try and the runs are almost immediate! Glad you both got to enjoy some time on the beach. There definitely was no closed sign! Uh-oh! Good thing Rocco didn't sample the salt water! Woof! Glad you found a dog-friendly beach. Cinnamon Beach in the Palm Coast is very dog friendly--we're going in a couple weeks. I especially like chasing the birds (and the rabbits) that live near the dunes. Happy you found some warm weather.... Been icky here. WestieWaves! Oh, that beach sounds perfect! Wish we were going with you! hehe! Rocco DOES look like he belongs there!! Perfect beach pup :-) Taking our pups to a dog-friendly beach is one of our resolutions for 2015 ~ can't wait to take them! Thank you for putting together a list of precautions to take! Thanks for stopping by! We'll look forward to hearing about what beach you head to! Rocco certainly does look great in that Fort Lauderdale sun! You captured some really beautiful photos of the water and the light! Harley has only been to a beach a couple of times and although he loves to swim, he felt compelled to bark at the waves!!! We haven't taken Charlie yet but I know he would love to rip around in the sand. Thank you! It was such a pretty morning. Hope Harley and Charlie get their own beach trip soon! He does look right at home...beautiful beaches in Ft. Lauderdale! We wish we lived closer! You're lucky out there in California! They let dogs off-leash at most of the beaches here. So I have to put something bright on Mr. N or I'd never find him. Oh that's so funny. He is sand colored, just like Rocco! It looks beautiful there! We love beach trips with Haley and these are some great tips. One thing we use on our beach vacations is Musher's Secret. It's a wax you can apply to your dog's paws either in the winter to protect from ice balls forming between their toes when it's snowy or during the summer to protect from hot pavement or beach sand. Some of the beaches we visit have extremely hot sand in the summer. I'm glad you had a wonderful, warm vacation! That's a great tip! Thanks for letting us know! I love this time of year, why wouldn't you with such good weather. Just a simple shirt of t-shirt and shorts, but yes winter is coming.